If you want a free skin for 'Fortnite Battle Royale,' Epic Games has a nice surprise for you! "Fortnite Battle Royale" developers make most money off in-game microtransactions, and fortunately for the players, these microtransactions have no impact on the gameplay. Even though the popular battle royale game is free, Epic Games makes a lot of profit by selling cosmetic items to the players, mostly skins and emotes. Luckily, the game developer sometimes releases skins that can be obtained for free, and they are doing it again this week. Once again, the popular video game developer partnered up with Twitch Prime, allowing players to obtain some exclusive cosmetic items for a limited time. While these items are not technically free, players can obtain them for free of charge by signing up for a Twitch Prime free trial. "Fortnite Battle Royale" players will be able to obtain the exclusive item pack starting May 9, and it's unknown when the special promotion will end. The special pack will include four cosmetic items, including a skin, an emote, a pickaxe, and a back bling. This is the second special promotion between "Fortnite" and Twitch. Trailblazer skin has already been leaked, and it turns out that this skin will be included in the Twitch Prime item pack. Beside it, players will receive True North back bling, Tenderizer pickaxe, and Freestylin' emote. If you are already a Twitch Prime member, you will be able to claim these items from the free loot section. If you don't have a Twitch account or if you are not a Twitch Prime member, you will have to sign up for Twitch and enable a 30-day free trial. After this, you will be able to claim the exclusive items, and you will also be able to cancel your free trial whenever you want. If you are a console player, you will have to link your PlayStation Network or Xbox Live account to an Epic Games account. Additionally, once you obtain these items, they will be available on any other device, as long as you use the Epic Games account you obtained it with. 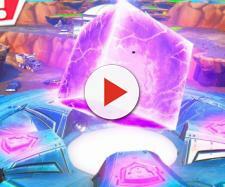 Dinosaurs coming to 'Fortnite Battle Royale'? In other news, it seems that the game developer is preparing another big thing for "Fortnite Battle Royale." First it was meteors, and now players might see dinosaurs in the game, or at least the destruction caused by these giant animals. Epic Games has left numerous clues in the game, and many players believe that the dinosaur destruction could happen. If you are interested in more details, watch the video below and let us know what you think!